Eat fresh, feel good. That’s the message at five corner stores in Philadelphia that now feature a Fresh Corner kiosk as part of the Food Trust’s Healthy Corner Store Initiative. On Sept. 19, Selinette Rodriguez of Polo Food Market (727 N. 10th St.) welcomed a crowd that included State Rep. Dwight Evans for the unveiling of her store’s Fresh Corner kiosk, which features a refrigerated produce cooler and a demonstration space for cooking lessons. Reminiscing about the corner store he frequented as a youth, Rep. Evans talked about the power of corner stores to spur economic development and encourage better health. Rodriguez is joined in the Fresh Corner initiative by the owners of four other food markets across the city: Olivares, Indiana, Yellow and Corner. In addition to the healthy food kiosks, Fresh Corner stores have hotspots and colorful signage throughout to call attention to healthful options. According to data collected by The Food Trust, people are getting the message. 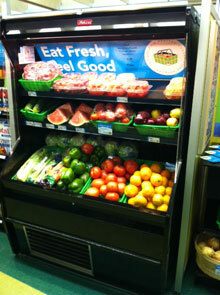 Using point-of-sale systems at several stores with Fresh Corner kiosks and some without, the Food Trust has found that sales of produce and water have increased by nearly 50 percent at Fresh Corner stores versus control stores. Story by Rosella Eleanor Lafevre.